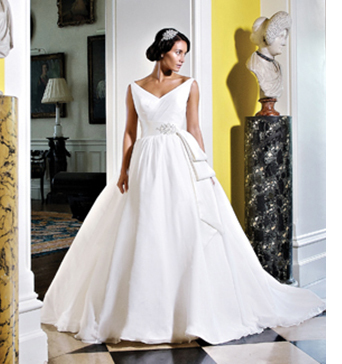 Brides, today, can find it difficult to find exactly the dress they are looking for. This may be because they have had an idea, since they were young, of what their dream dress would look like, but they can't find an exact match. Or they try many dresses which are "almost perfect"; if only a certain aspect was different. One of the best ways around this is for brides to consider going down the bespoke route. Many brides instantly dismiss this option as they assume it will be too expensive and problematic, but it can mean a missed opportunity- it does not have to cost the earth or be a stressful experience. Any bride who is fearful of having a complete bespoke dress can dip their toes into the experience by asking for alternative options on an existing design. Ask your local bridal store for advice on any bridal manufacturers who allow bespoke changes to be made to their dresses. This would allow you to change a neckline, add straps or swap a beading detail for example. Check with the store about any extra costs involved, it can vary from company to company; some won't charge for a small alteration whilst others can charge a moderate to large fee, depending what you want. This is enough for some brides to feel they have been able to add a personal touch to their dress. Other brides may want to stamp their personality on their wedding day by having a bespoke dress made from scratch, allowing them to choose every aspect in the production of it. In this case the most important advice I can offer is to spend the time to find the right bridal designer for the job. Choose a designer whose other dresses you love and who uses the fabrics you like. For example it's no good choosing someone whose style you like but who doesn't work with silk fabrics if you have set your heart on a silk dress. Do your research. If there are a few designers you are considering, discuss your budget with them and find out if there are additional charges for having a bespoke dress designed. Not all designers will charge the costs that brides imagine will be involved with having a dress specially made. When you know who to go with, the fun part can start. The bespoke process usually involves an initial appointment to discuss ideas and try different dress shapes to eliminate certain styles and focus on the elements the bride wants. Keep an open mind and trust the designer; years of experience designing wedding dresses will mean they can advice on the best options for you. As a designer I love this; it's always a challenge to create something new for an individual bride and it’s very rewarding. I show brides the fabric samples and have various sketches ready for the second appointment, to be able to give them options to choose from based upon our original consultation. The most important thing is to design a dress the bride can feel completely comfortable in- an authentic match for their personality. So for any brides out there, who still feel they have not found "the one", don't be afraid to consider a bespoke dress. Having an individual gown, made just for your special day, will be an experience you will never forget. It will allow you, on the day, to know that you are wearing something truly unique!